Gone is the time of adventure films like “E.T.” and “The Goonies,” films held close to my heart. To me what is most unique about these films, to borrow and modify a famed expression, are the seemingly ordinary child protaganists, in extraordinary situations. There are two types of kids in movies, kids who act/speak like how adults think kids speak, and kids who act/speak realistically. In films like “E.T,” “The Goonies,” and “Super 8,” the kids feel much more real than in other films, and the actors who embody the characters are believable, and truly funny and entertaining. “Super 8,” was my most anticipated film of the summer season, produced by Steven Spielberg and Amblin Entertainment, my hopes were that this film would be a return to adventure films of years past. What director J.J. Abrams has put together is a wonderful and enjoyable film that pulls a lot of inspiration clearly from his childhood, and most likely the films that drove him to become a filmmaker. The film opens at the wake of Joe Lamb’s (Joel Courtney) Mother, who died in an accident at a local mill. Joe’s friend, Charles (Riley Griffiths) is planning a zombie film that he wants to submit to a regional film festival. A few months pass, and Charles has cast Alice (Elle Fanning) in his film. The group of friends go off in the middle of the night in Alice’s Dad’s “borrowed” car to shoot scenes for the film near a train station. That is when all hell breaks loose, a truck drives head-on into an oncoming train, derailing it, and something is released in their small town. Dogs run off, the town starts having severe electrical problems, everything from microwaves to car engines are missing. The Air Force, led by Colonel Nelec (Noah Emmerich), rolls into town. The mystery continues as Joe’s father, Deputy Jackson (Kyle Chandler), is attempting to keep peace in a town where things are spiraling out of control. The kids, while keeping the crash they witnessed a secret, continue to shoot their film around all the exciting things happening in their town (military out in force, huge derailed train wreck), on Charles urgings that its all increasing his films production value. Anyone whose ever made a film with their friends as a kid can relate to any of Charles efforts. The scenes where they are making their film had me grinning from ear to ear. In fact, most of the film had me grinning, “Super 8” made me feel like a kid again. The film pulls pages from “E.T.” “The Goonies,” and “Close Encounters of the Third Kind,” and it knows it. The film is filled with great moments ripped straight out of Spielberg’s playbook, though, at least for this reviewer, nothing can ever be as good as the films it pays homage to. The cinematography is masterful as we’re used to in Abrams’ films, anamorphic lens flares are abound, fortunately brought on by realistic light sources. Unlike the iconic “E.T.,” there is nothing that particularly stands out about Giacchino’s score, which is unfortunate. I’m pleased to point out that nothing particularly bothered me about the CG, Abrams held back his usual CGI-happy hand, only resorting to it for moments that was completely necessary. Obviously, there are still many effects shots, without spoiling anything, I will say that he waits till the absolute last moment of the film to use it. 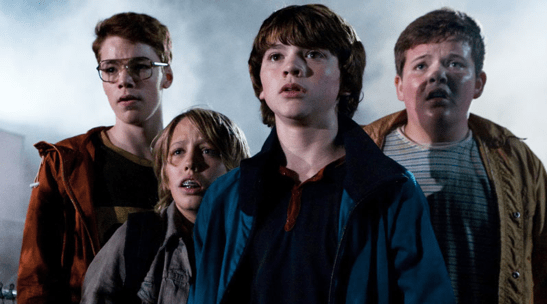 “Super 8,” while not as good as any of the films its inspired by, is still probably going to be one of the best studio films you see this year – as well as probably the best summer movie we’ll see this season. It is filled with childlike joy, exciting adventure, great acting and story, and loud exciting explosions and effects. “Super 8,” is the type of film that reminds us what perfect summer movies should all be about, excitement, and adventure.